Although I spend most of my time writing about trumpet/music related matters, there will be times when other topics are worthy of discussion. This is one of those times. A few weeks ago, Giordano’s opened a store in Indianapolis. For those of you that don’t know what Giordano’s is, first of all- shame on you- it’s a Chicago based stuffed pizza restaurant. If you haven’t been to Chicago and tried the stuffed pizza, my advice to you is simple: Go! (you’re welcome). 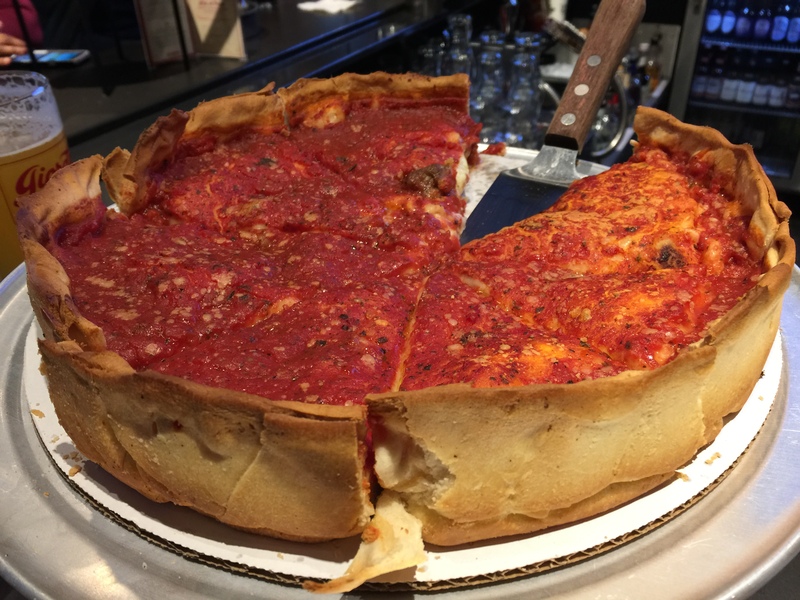 There are several terrific places around town, but if you’re looking for a recommendation, try Lou Malnati’s. One of the specials is The Malnati Chicago Classic. It’s a sausage pizza with extra cheese on their special Buttercrust. In a city full of great pizza, this is my favorite. Okay, back to Giordano’s. With a store opening in Indianapolis, I was curious to see if it was a real Giordano’s, or a franchised version that would only serve to remind me what I’m really missing. My hesitancy is based on experience. There is ONE other Chicago based pizza place that opened up franchises around the country that didn’t quite hit the mark. This ONE place has great pizza in Chicago, but the franchises just don’t live up to the original. I certainly won’t mention the name here, or give even ONE clue. It was fantastic. It’s good to know that it’s a real Giordano’s. This got me thinking about one of the best parts of traveling- eating the local food. I’ve been lucky enough to play trumpet on six continents, so I have plenty of experience. Too many times people default to what they know, in large part because it feels safe. I know there are times when convenience can dictate choice, but I have found that the extra work for something special is usually worth it. When away from home, ask for a recommendation. If you ask someone for their favorite pizza place, and the answer you get is the name of a national chain, ask someone else. If that someone else gives you the name of a national chain, get a new town. Mother Bear’s– A student favorite that is right across the street from the School of Music. Try the Dante’s Inferno. Lennie’s– Along with really good pizza, a terrific menu, it’s also a microbrewery. Try the Love Supreme (although I do it without mushrooms). Aver’s-There are three locations around town that all deliver. They also have some interesting specialty pies. Although I was initially hesitant, I do like the Cream and Crimson. If you’ve got any suggestions on good pizza in the any of these areas, please let me know. Max’s Place in downtown Bloomington also has fabulous pizza if you’re in the mood for thin crust. The “Burn Your House Down” pizza is delicious. Great microbrews on tap, too. Joey, I’m surprised you didn’t mention how you became a pizza connoisseur! High school….after football games….Godfather’s Pizza!